If you’re the kind of person who uses color labels for organization or are just very visually oriented, Twimbow may be the perfect Twitter client for you. 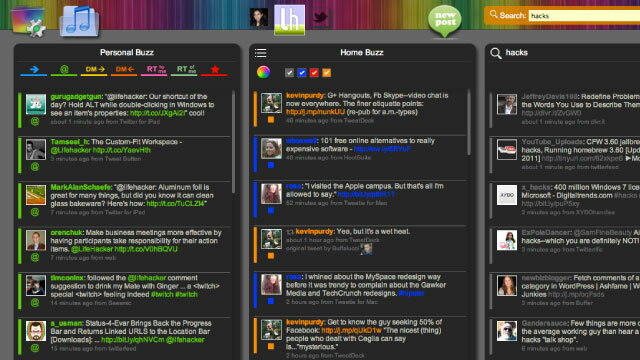 The free webapp looks like TweetDeck but adds color labels, filtering, and other interesting features. The constant deluge of tweets makes it hard sometimes to keep up with what’s happening and who’s interacting with you on Twitter. Twimbow, which recently came out of private beta, tries to solve that by adding default color-coding to your main Twitter activities (your tweets are in blue, replies to you in green, direct messages in yellow or orange, etc.). For your main Twitter stream, the people you follow, you can add customizable labels such as “Friends” or “Tech Blogs” and color them as you see fit. Twimbow doesn’t give you just a handful of colors to choose from—you can use the color picker or enter RGB values or hexidecimal values to really fine-tune your color labeling. Twimbow also offers a filtering feature to remove tweets that contain specific words, supports a few keyboard shortcuts, and has a few styling options (if you don’t like the dark gray option, for example, you can switch to a light background). If you’d like to see the Twitterverse custom colored, check out the free app below.